Often times when you begin having a problem with your ceiling fan remote, there is no problem with the remote itself at all. 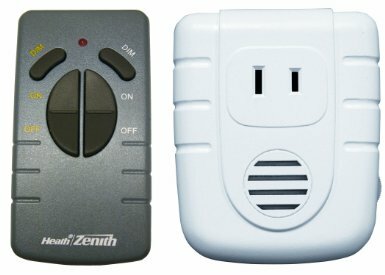 A lot of problems with your remote communicating with your ceiling fan are generally related to the receiver, which communicates with your remote control. The receiver for your remote is located within the ceiling fan housing itself. They are more likely to go over the years; also times you can have a defective receiver right out of the box. My ceiling fan shuts off by itself, what should I do? One thing a lot of ceiling fan troubleshooters and enthusiasts say, is the DIP switches can be at fault inside of receiver. The dip switches in an apartment building for instance might all be wired the same way for all fans in the building, so someone next to you or below you might be turning your fan off when they turn theirs off. Because of frequency issues this can happen. Also it can happen the same way if you have multiple ceiling fans inside of the home. To start troubleshooting the dip switches on the fan, you need to try changing the position of the dip switches. There would be dipswitches on/in the back of the remote, as well as on or in the fan canopy. The dip switches need to match each other in order for them to be on the same frequency, and work properly. To troubleshoot a ceiling fan dipswitch problem first ensure that the dipswitches on both the fan and the remote line up. If you had to throw a switch or change something so they are in sync, try again. Is it working now? If not, then try setting all the switches on the fan or remote to off. Then turn them all back on. Do this for the other device as well. One all the switches are up or down, now try setting the two devices in the same pattern, so they sync. You can try the original pattern they came in when they arrived, or a new pattern you yourself create. If you are having problems with the fan turning on by itself, then you want to change the pattern so it's different. My ceiling fan lights, reverse button, or other buttons don't work on the remote, what should I do? If this is happening right out of the box, then it can either be a problem with the way the remote has been programmed to your fan, a bad remote, or a defective receiver. Make sure to check the batteries on the remote first. If you just bought the fan, try to reprogram the remote (if it's possible) using the instructions that came with it. If this doesn't work, take the fan and all accessories back to where you purchased it. If you've had the fan a long time and it's just starting to happen now, check the batteries on the remote. Then try to reprogram the remote with the fan (if possible), then try replacing the remote. If still no luck, replace the receiver. Wiring problems are common with receivers. You can choose to take your receiver apart, if you feel confident in troubleshooting it. If you decide to go that route, then we recommend using this wiring guide which describes all the different wiring colors related to ceiling fan installation. The wiring guide can be extremely useful if you have a bunch of wires, and you don't know which wire does what. 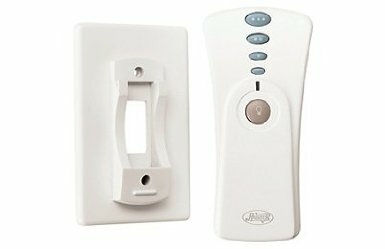 Hunter white color receiver and remote help you adjust your fan in three speed controls and the receiver fits between ceiling and canopy. Remote comes with wall holder for remote to be hand held. Fan uses 2 amps and light uses 300 watts electricity. Item model number of the product is 27187 and product dimensions are 11 x 9 x 4 inches. 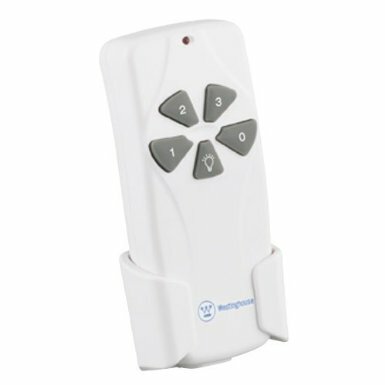 Health Zenith wireless command remote control lamp set is with part number SL-6008-WH-A and is made of plastic material. Product is white in color and is backed with 1 year warranty. You can operate up to 100 feet distance to adjust the lighting. Very easy to install and does not need any wires to be connected. Battery lasts for two years and you can switch off or on the lights while you sit in the car or you are out side your home. Westinghouse ceiling fan and light remote control set controls your fan in three adjustable speeds and is a wireless remote control. This remote control operates from a distance of 50 feet. It also includes full range light dimmer. It operates with a 9 Volts battery and is UL and CUL listed product. This is compatible for almost all types of ceiling fans. A wall holder is also provided for holding the remote to the wall. Item model number of the product is 7787000 and product dimensions are 7.2 x 3.2 x 8.2 inches.